For the Kinkade family, the yearly pilgrimage to Walt Disney World® was always an enchanting inspiration. 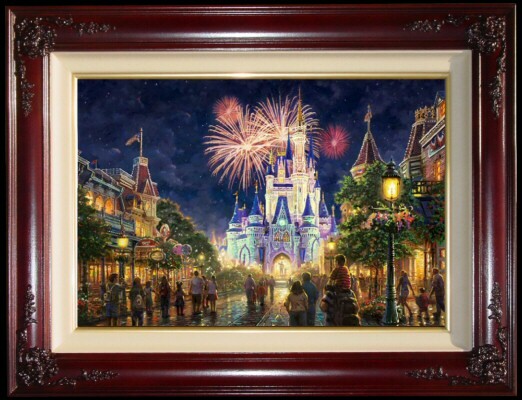 Thomas Kinkade once said, "Two of the dream-memories we take from childhood on our life's journey are the wonder and excitement of Walt Disney World® and the soaring majesty of castles." It is this wonder and excitement that greets us when we first step through the tunnel under the Walt Disney World® Railroad and travel back in time on Main Street U.S.A. ® Inspired by Walt Disney's hometown, Walt wanted this land to relive a simpler time filled with happy carefree memories shared with family and friends. As you journey along the Victorian-themed Main Street in a horse drawn trolley, fire engine, jitney, horseless carriage, or on foot, you'll pass such hometown staples as the Main Street Bakery and Main Street Cinema from a time and place long since passed. 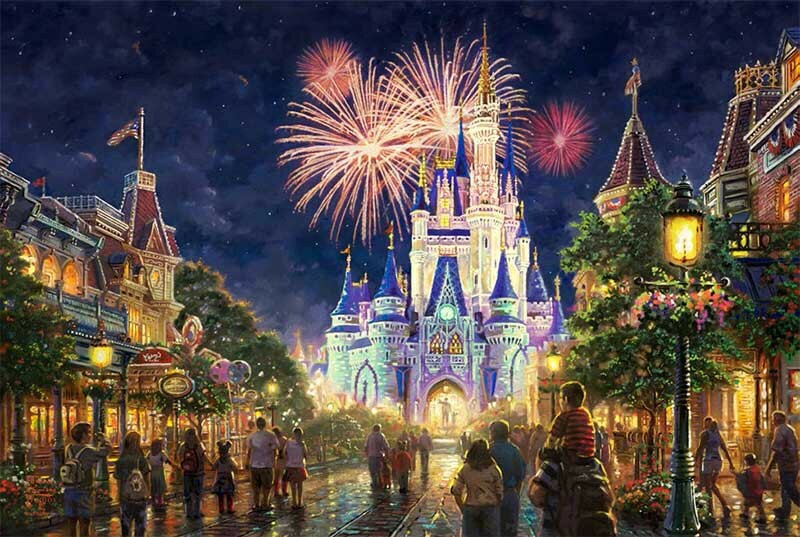 Main Street leads us into a Magical Kingdom and to the soaring threshold of the majestic Cinderella's castle. Lit at night by the Wishes Nighttime Fireworks Spectacular, it reminds us of the wishes we all share – for the magic of simpler times, happy endings, the laughter of children and the love of family and friends. Thomas Kinkade Studios is proud to present Main Street U.S.A., ® Walt Disney World®. It is our hope that you will join us in celebrating the magic.